Heller Shorts 2017 - "The Dog 8 My Shorts"
For its eighth year, "Heller Shorts" presented another magnificent evening of short plays. Exploring the theme of "bad excuses," these plays ran the gamut from time-travel comedy to familial drama, from psychological thriller to romantic comedy! There is no more variety in Tulsa theatre than "Heller Shorts!" And with local playwrights, directors, cast, and crew, your support of local theatre has never reached a wider array of creatives at once. An original play by University of Tulsa professor Bruce Dean Willis, directed by David Blakely, and presented in conjunction with Tulsa Latino Theatre, Time for Chocolate is a tale of war, family, coming-of-age, and ancient Mexican history told with the poetry known as “flower song.” Time for Chocolate features metaphysical debates, exciting fighting, historical riddles, bawdy rhymes, and of course, mushroom-laced hallucinogenic chocolate for everyone! For consideration in each month’s event, plays must be submitted to secsunsersub@gmail.com by the 1st of that month. There is no submission fee and playwrights may submit up to two scripts each month, though only one can be performed per month. The three playwrights who won to the following month will receive royalties. To close out our first all-original season, HTC presents an evening of one-act plays by three local playwrights. We are excited to be showcasing an evening of longer one-act plays for the first time. The playwrights are David Blakely, Heller Theatre Company Playwright-in-Residence and TATE-winning playwright of last season’s “The Light Fantastic Or In the Wood;” Michael Wright, University of Tulsa Applied Professor of Creative Writing, Film and Theatre, and Theatre Critic for Tulsa Voice; and Archer Williams, the winner of 2017’s Heller Shorts “Best in Show” contest. 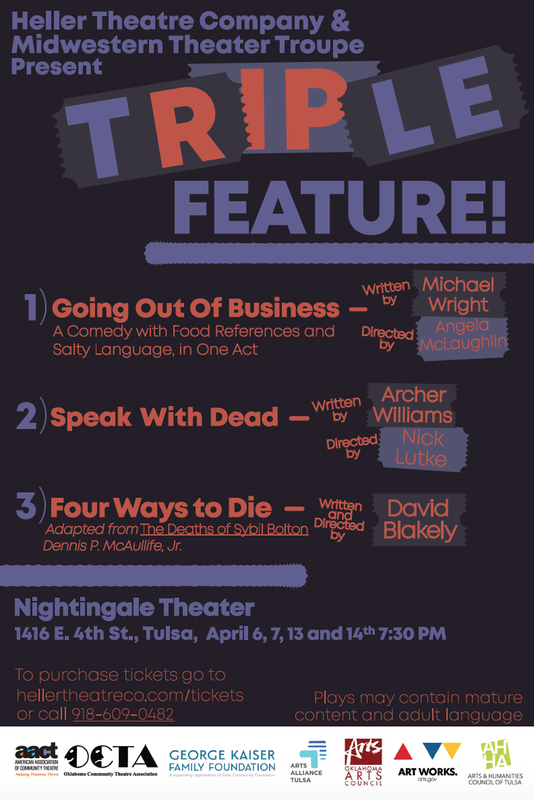 Performances will be held April 6, 7, 13, and 14 @7;30PM at Nightingale Theater, 1416 E. 4th St.